Founded in October 2010, NOHMs Technologies has developed a battery based on lithium-sulfur chemistry. In April 2013, the company was awarded a $500,000 Phase II SBIR Award from the National Science Foundation (NSF) to scale a novel low-cost manufacturing process for long-life sulfur cathode composite materials. NOHMs (Nano Organic Hybrid Materials) will locate to and use facilities at the Kentucky-Argonne Battery Manufacturing Research and Development Center and the University of Kentucky’s Spindletop Administration Building. NOHMs is developing electrode, electrolyte, and separator products as a 3-part solution for high-energy, low-cost, long-life, and safe batteries. NOHMs says its composite sulfur electrodes—carbon nanoparticles infused with sulfur developed at Cornell – can deliver a specific capacity of 550 mAh/g for hundreds of cycles. Next-generation cathode materials being developed will exceed 800 mAh/g, according to the company. The company claims a class of novel, non-flammable electrolytes that yield >99.9-percent Coulombic efficiency (CE) with high ionic conductivity and high thermal stability. Most researchers rarely mention battery separators, but NOHMs is developing a hybrid materials thin-film separator that provides a ceramic-polymer-liquid barrier to stabilize the lithium anode, that should increase the lifetime and safety of lithium-sulfur batteries. According to the company, “NOHMs uses sulfur-infused carbon composite cathode materials developed at Cornell, as well as an electrolyte chemistry developed there. NOHMs’ highly tunable technology builds a composite micro-porous carbon framework that hosts electro-active nanoparticles. “This carbon framework is (i) flexible to tolerate many charge-discharge cycles; (ii) porous to allow full-access for lithium-ions to active material; (iii) electrically conductive; and (iv) scalable for manufacturing, providing an advantage over other particle-based, coating-based, or substrate-based solutions. NOHMs has successfully tested its materials in battery prototypes. This may turn into a Kentucky-Tennessee battle, with Oak Ridge National Laboratory scientists having announced their lithium-sulfur research a few months ago. “The new ionically-conductive cathode enabled the ORNL battery to maintain a capacity of 1,200 milliamp-hours (mAh) per gram after 300 charge-discharge cycles at 60 degrees Celsius. 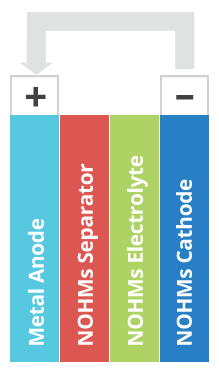 For comparison, a traditional lithium-ion battery cathode has an average capacity between 140-170 mAh/g. Because lithium-sulfur batteries deliver about half the voltage of lithium-ion versions, this eight-fold increase in capacity demonstrated in the ORNL battery cathode translates into four times the gravimetric energy density of lithium-ion technologies,” according to ORNL researchers and reported in this blog. NOHMs’ management team includes Nathan Ball, CEO; Dr. Jayaprakaash Navaneedhakrishnan, chief scientist; and Dr. Lynden Archer, founder, technical advisor and William C. Hooey, Director of Chemical and Biomolecular Engineering at Cornell University. The original Cornell international patent application for this technology can be found here, and some surprising characteristics of the materials involved here, including their use as lubricants and heat transfer fluids. Cornell also claims electrical properties far exceeding those NOHMs promotes as more practical at this time. The future of battery power could be very interesting. 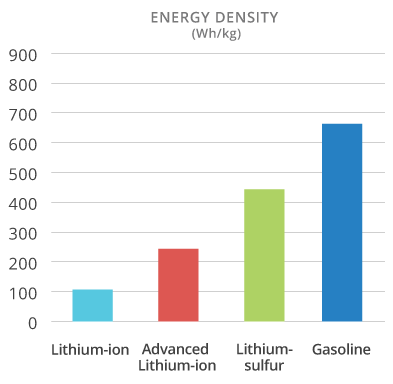 The Li-S battery sounds exciting, and performance as close to gasoline as is shown in that graph would make the case for electric power compelling in situations where reliability, ease of use and low maintenance cost were important (relative to pure performance). But, the graph is perhaps not realistic. Gasoline has an energy density (when burned) of about 46 MJ/kg. Now, 1 MJ = 1,000,000 J = 1,000,000/3,600 Wh = 278 Wh. So, 1 kg gasoline can be burned to produce heat energy of 46 x 278 = 12,788 Wh = 12.8 kWh. The chart shows gasoline producing mechanical work (I presume) at what looks like 660 Wh/kg. That implies the use of a gasoline engine with thermal efficiency of just 660/12,788 = 5.2%. Ouch. Practical gasoline engines, off the shelf, today offer about 5x that level of thermal efficiency. The gasoline bar should be closer to 3,300 Wh/kg. Batteries still have a looooong way to go! looked at the graph, said wow. Read the comment by Mr. Boyle, said aw shucks. Am I missing something? is there an informative site that better explains this gas-electric comparison? I have been backing electric powered aircraft for 12 years and report gains made to our local EAA chapter. I enjoy beating the electric power drum. Pikes Peak motorcycle division won by an electric bike was a great example of where we are going. keep up the great effort that keeps us informed.